Premium slim case. Amidst Samsung's Series 9 refresh, there is now a model featuring a matte 15 inch screen available. In return, the smallest member has not been updated. 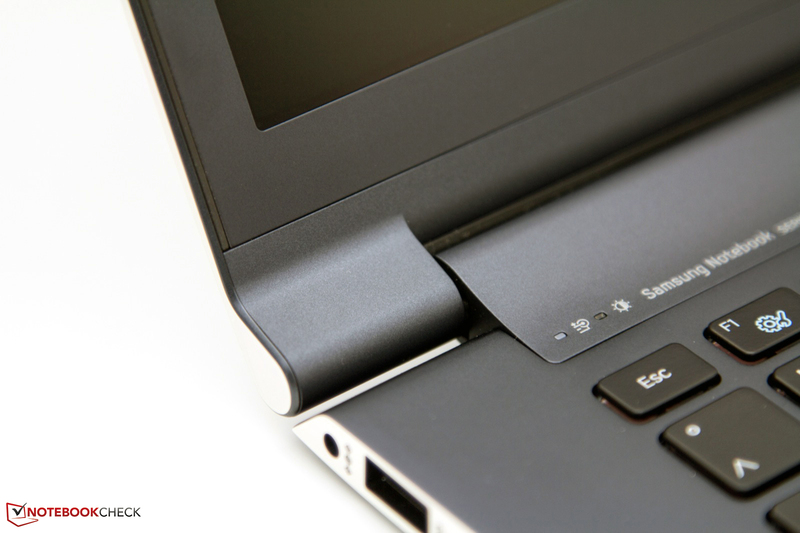 The South Korean manufacturer demands steep EUR 1999 (RRP) for speedy hardware in a slim case. 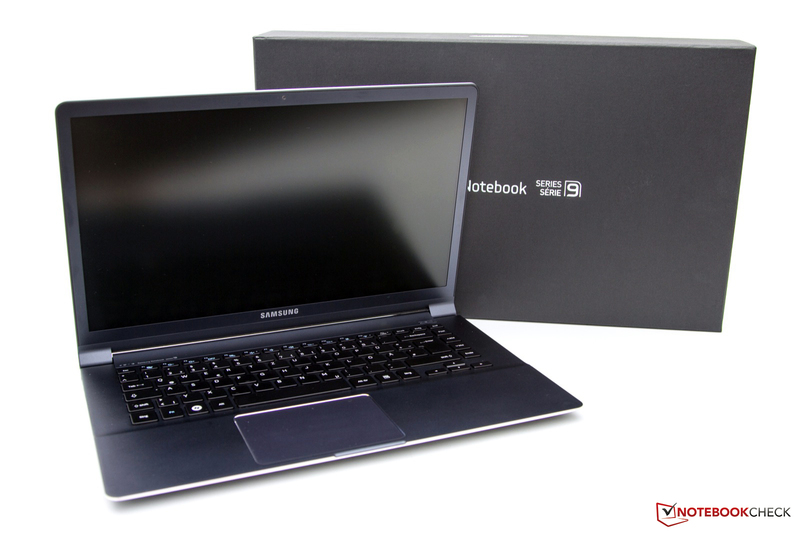 At the 2012 Consumer Electronics Show (2012 CES) in Las Vegas, Samsung unveiled its latest revisions to the premium Series 9 subnotebook family. 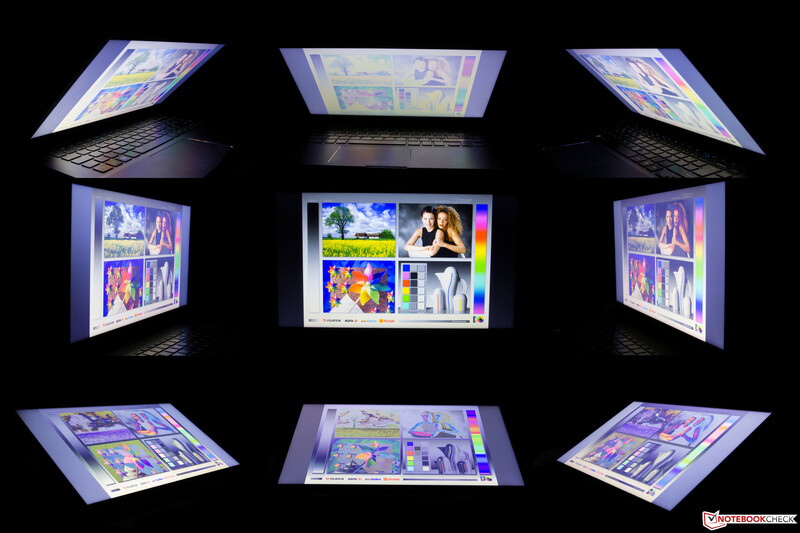 The 13 inch 900X3B received new features as part of its overall model revision. The 11 inch 900X1B was not revised during this product cycle. More interestingly, we were able to review the newest member of the family, the 900X4B featuring a 1600x900 HD+ 15 inch display. At the CeBIT 2012 tradeshow in Hanover, Germany, the 900X4B was on display again, showing minor modifications to the aluminum chassis and overall color scheme. Despite the increased display size, the 900X4B remains sleek and stylish. 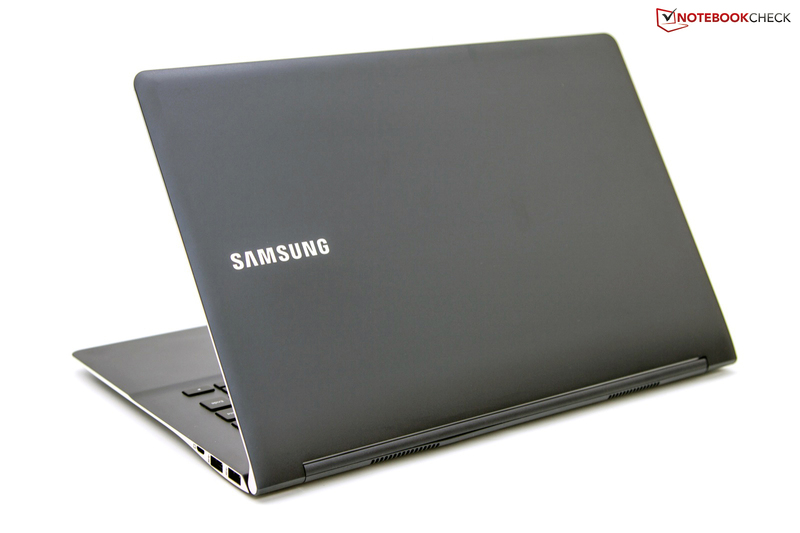 Its maximum thickness of 14.9 millimeters (0.6 inches) and weight of 1.67 kilograms (3.67 pounds) allowed Samsung to use high performance components such as Intel's Core i7-2637M 1.7 GHz Sandy Bridge dual-core processor, a 256 GB solid state drive (SSD), and 8 GB of DDR3 RAM. Samsung is working on even newer revisions that will be available in the next few weeks, featuring Intel’s third-generation Ivy Bridge dual-core processors. In this review, we will examine our test sample, the 900X4B-A01DE. 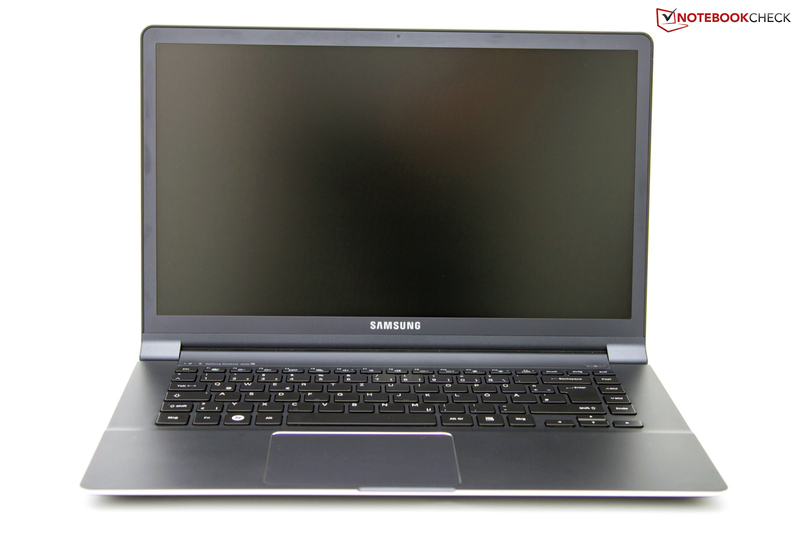 As Samsung’s “Premium Ultra Thin” notebook, the 900X4B-A01DE features premium equipment and is placed firmly in the upper end of the price spectrum for consumer notebooks. Our tested configuration has a manufacturer’s suggested retail price (MSRP) of 1,999 Euro ($2,500 USD) but can be found starting at 1,750 Euro ($2,200 USD) in various online retailers. As with the other models in the Series 9 family, the 900X4B features a unibody case fabricated entirely from high-grade aluminum. The case gives a high-quality impression at first glance and its dual-tone finish adds a touch of style. As one might expect from a device measuring 14.9 millimeters (0.6 inches) thick and weighing 1.67 kilograms (3.67 pounds), the chassis exhibits a high level of rigidity for devices of this class. The lid demonstrates high degrees of both compressive strength and torsional stiffness that are pleasantly surprising. The display can only be twisted by the most marginal degrees and the wrist rest does not yield at all. While the 900X4B retains many of the aesthetics of the previous generation of Series 9 notebooks, this generation does not feature the light duralumin trim that was used previously. As well, the case is now charcoal grey instead of black. 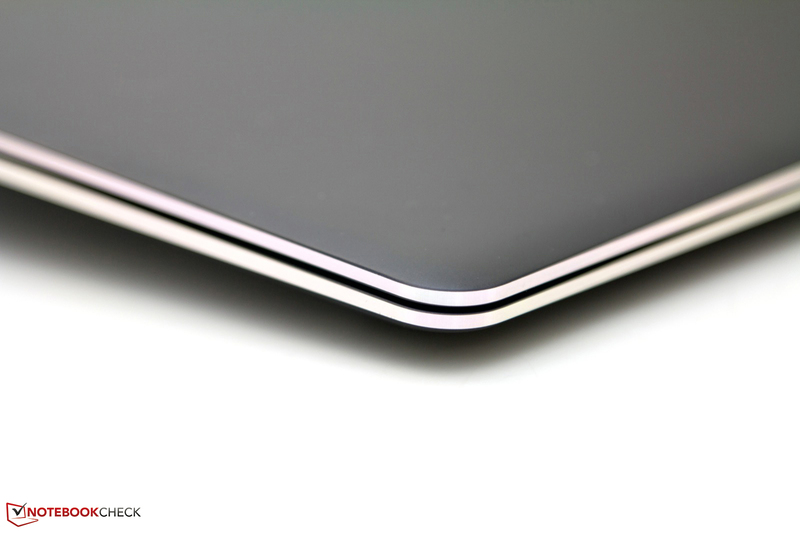 The touchpad remains offset to the left and is separated from the wrist rest by a visible, tangible aluminum rim. 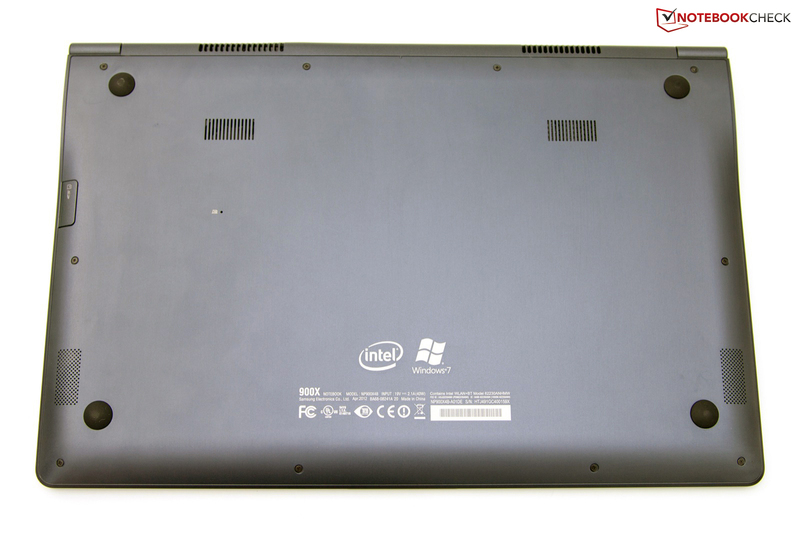 The case’s underside only houses a few vents, device information, and the Intel and Windows logos. In our review of the Samsung 900X3A from last year, we noted that its surfaces were coated in a sensitive paint that quickly acquired fingerprints and were difficult to clean. The 900X4B features surfaces with a similar fingerprint-attracting coating but is at least easier to clean. Aesthetically, we found the choice to change the color of the display bezel to match the chassis a bit disappointing. Overall, we found the physical and mechanical aspects of the case to be impressive and comparable to those of the Apple MacBook Air. Recently tested 13.3 inch ultrabooks and the 15 inch Acer Aspire Timeline Ultra M3 do not match the test sample in terms of aesthetics, feel, or stability. For this product revision cycle, Samsung chose to improve connectivity and omit the awkward, albeit stylish, covers from the previous generation. While the previous generation placed ports in the middle of both sides, the 900X4B has all ports located in the rear third of each side with a good distribution of ports on each side. 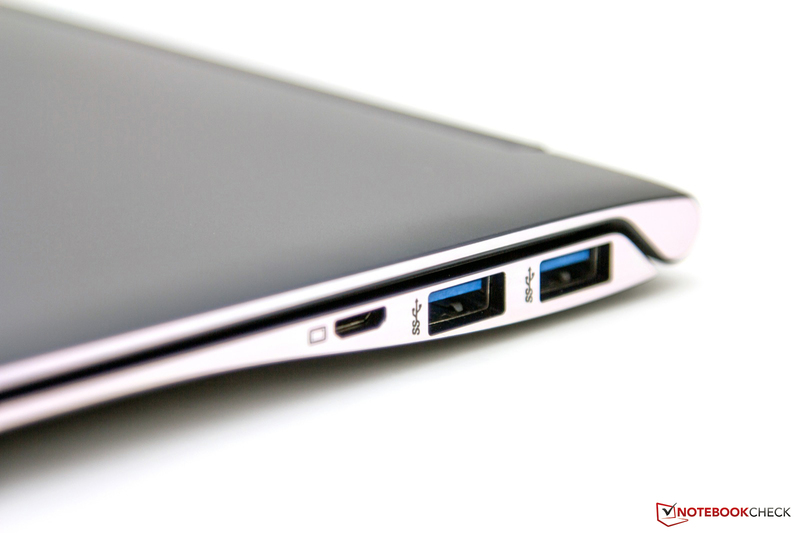 The right side features a card reader – hidden by a flap – as well as two USB 3.0 ports for fast peripherals, and a VGA port. The left side houses a power jack, a USB 2.0 port featuring sleep-and-charge, a single combination audio jack, a micro-HDMI port, and a proprietary RJ-45 port. 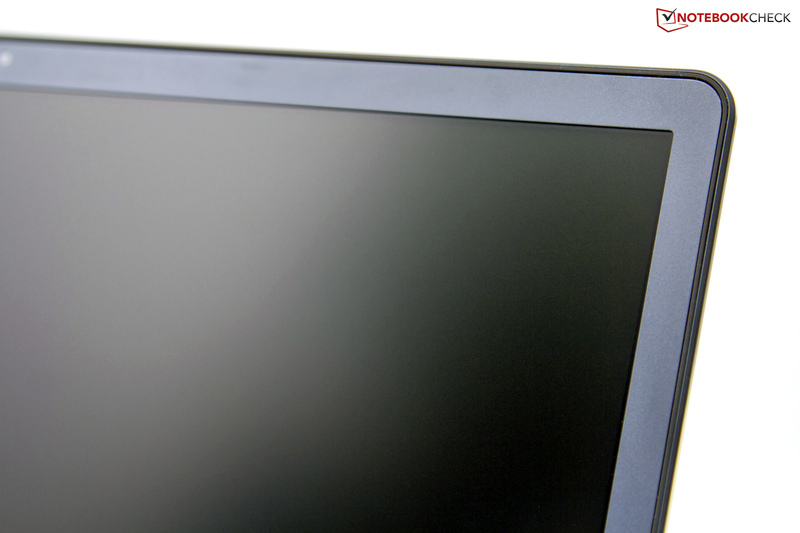 External monitors can be connected to the 900X4B through the use of either the micro-HDMI or VGA ports but both options require additional adapters that must be purchased separately. We found this to be a bit disappointing due to the high price tag of this unit. The required RJ-45 adapter is thankfully included in the package. By using a combination audio jack for both input and output, Samsung manages to save space but at the expense of being able to use both speakers and an external microphone without requiring a separate USB audio adapter. While there are no optional extras such as an integrated Universal Mobile Telecommunications System (UMTS), the 900X4B features almost all current communication standards – Wi-Fi standards 802.11 b/g/n, gigabit LAN adapter, and Bluetooth 3.0+HS. Unfortunately, the faster and more energy efficient Bluetooth 4.0 is omitted. The requisite RJ-45 adapter for LAN connections is included in the product packaging. Even though the 900X4B is not a business model, entry-level security features are installed. 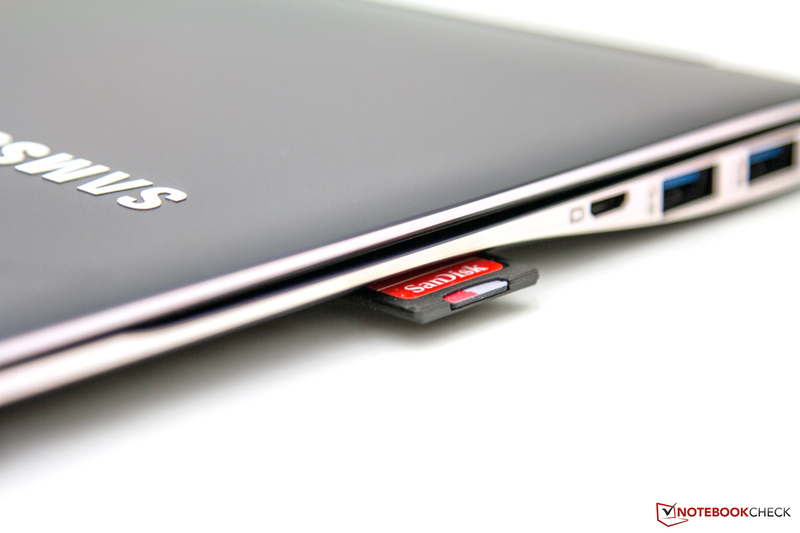 In addition to the optional BIOS password and hard disk encryption, the notebook features the Trusted Platform Module (TPM) that is only rarely found in consumer devices. Strangely, Samsung omitted the simplest security feature – a Kensington lock slot – in this product cycle. At first glance, the black product packaging makes a good impression. Opening the package revealed that only the usual accessories – a power supply, a few documents, and a recovery DVD – are included. The choice of a recovery DVD is somewhat bewildering as the notebook does not include an optical drive. 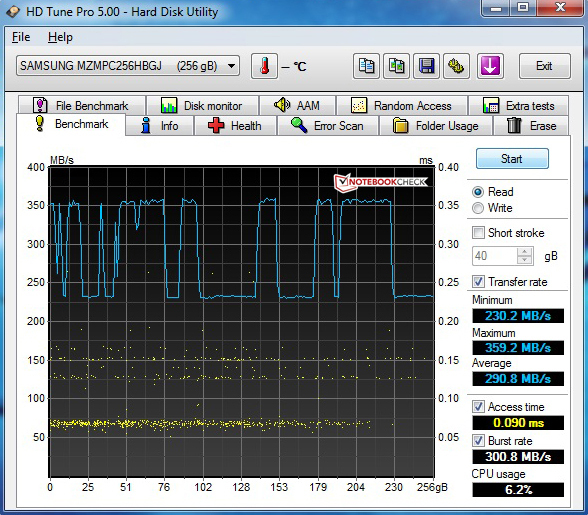 Apparently Samsung chose to break with the accepted practice of using a hidden partition to host system recovery data. 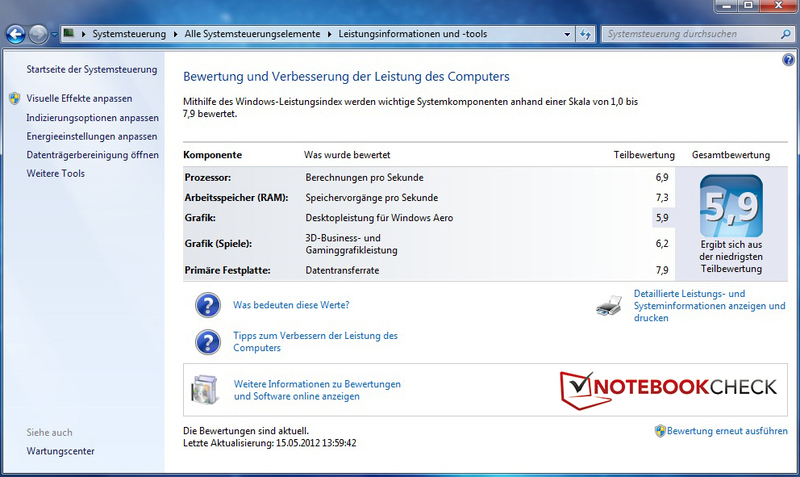 The included software bundle is unremarkable and includes only freeware, the typical Microsoft Office trial version, an anti-virus program, and Samsung tools. Most of these applications can be deleted without a second thought. 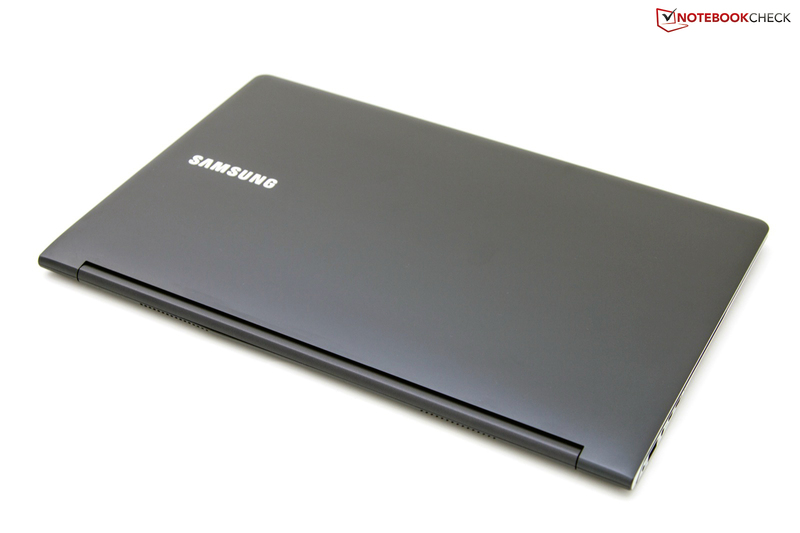 The Samsung 900X4B is designed for hassle-free maintenance and expandability. The entire base plate can be taken off after removing a few screws from the underside. The card reader’s opening proves helpful in this endeavor. 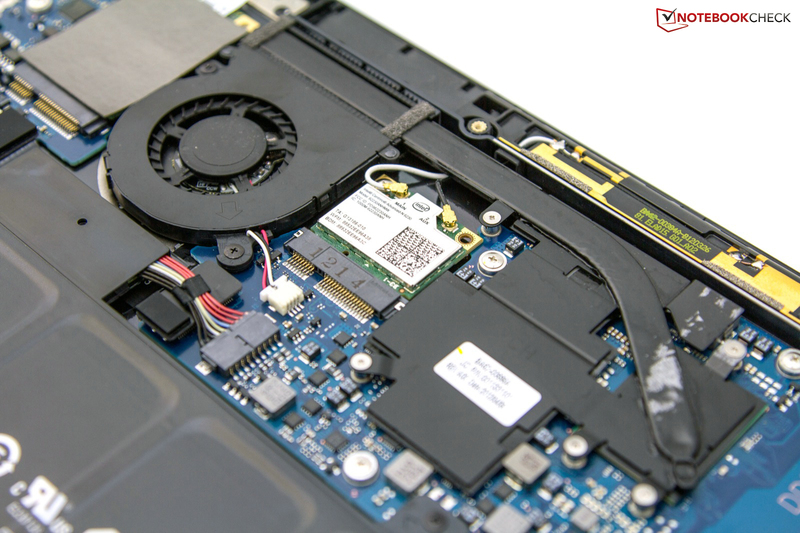 Removing the base plate reveals two DDR3 RAM banks, a small case fan, the large lithium-polymer sheet battery, and the Samsung mSATA SSD. All of these components can be easily accessed and removed. Two screens hold the fan which can also be quickly removed and cleaned. 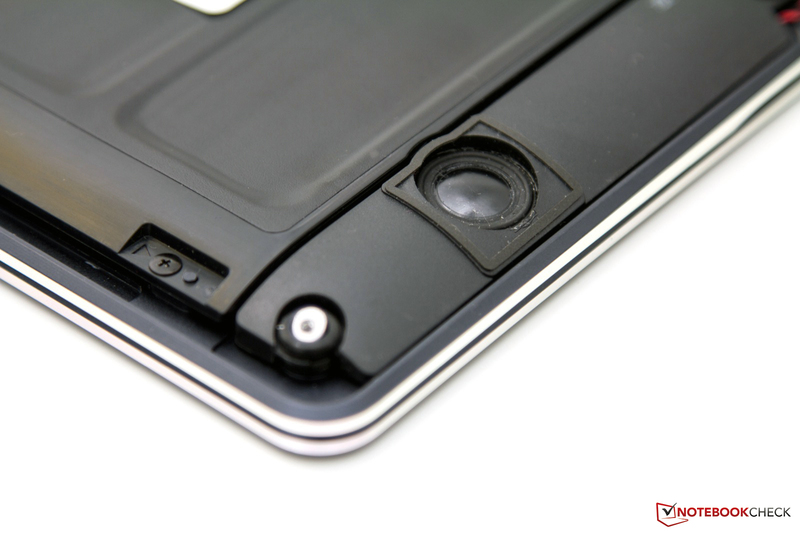 The battery could potentially be replaced by an inexperienced user as well. Samsung provides a 24 month warranty. The warranty begins on the date of purchase and can be extended, within 90 days of purchase, to 36 or 48 months for an additional premium. The costs of these extensions were not publicly disclosed on the Samsung website at press time. 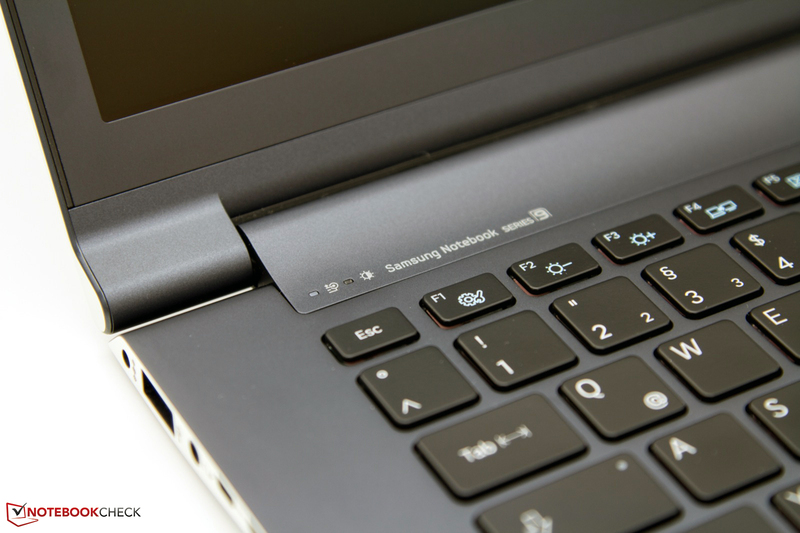 For this revision, Samsung maintained the black single-key chiclet-style keyboard of the previous generation. Unlike the previous generation, the keys have been lowered slightly and are now completely encapsulated by the aluminum unibody, a marked improvement over the keyboard inlay and glossy plastic keys found in the 900X3A. The 900X4B’s keys present good feedback, the pressure point is accurate and crisp, and the key drop is short making for a pleasant tactile experience. The 15 inch 900X4B offers an additional advantage over the smaller 900X3A in the form of a large wrist rest area that will prove comfortable to all users, even those with larger hands. The larger profile is somewhat wasted by the addition of another column of keys that hosts the Home, PgUp, PgDn, and End keys at the right end of the keyboard. This layout may require some time for familiarization for typists who are accustomed to having the Enter and Right Shift keys at the far right of the keyboard. These extra keys certainly caused more than a handful of typos while writing this review on the test device. The keyboard features a built-in backlight that is handy for low-light situations. While useful, the backlight only has four intensity levels instead of the typical ten levels found in other high-end notebooks. As well, the 900X4B achieves this backlighting through the use of an illuminated mat instead of individual LEDs. 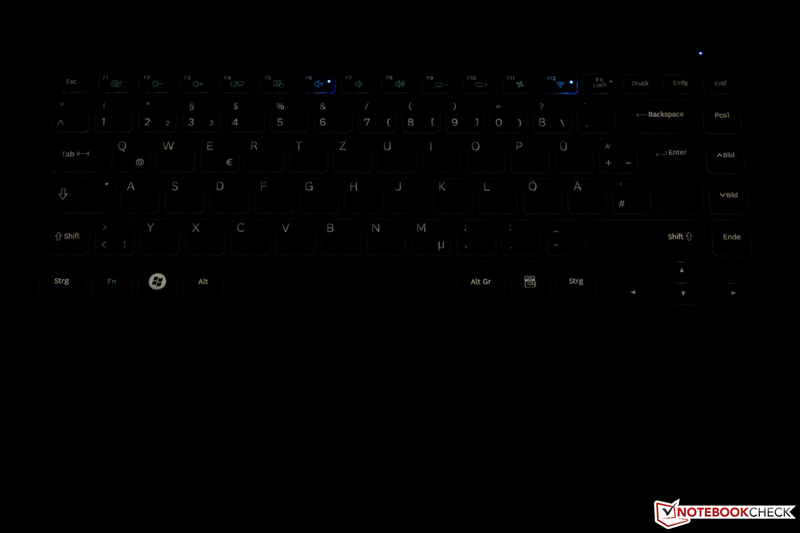 The result is a milder backlight that only slightly illuminates the keys alone. There is no gap or edge lighting visible with this backlight. 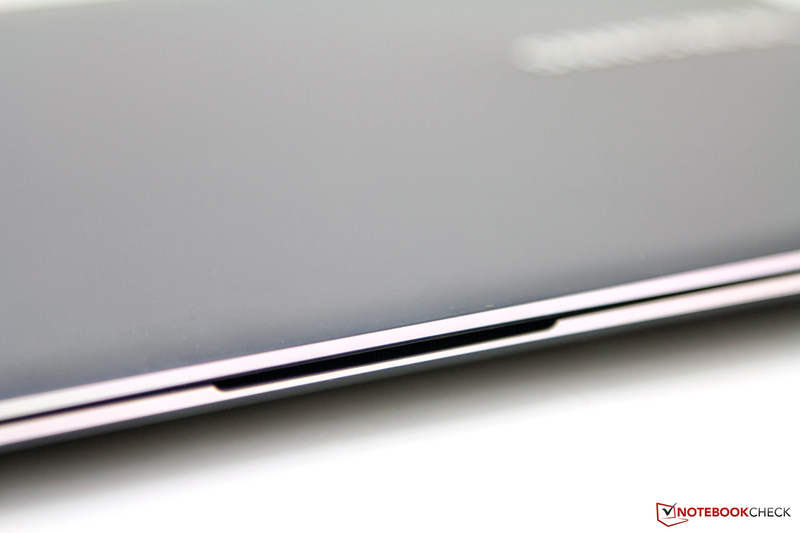 As is typical for Samsung devices, the touchpad is placed off center and to the left. The touchpad measures 107 millimeters (4.2 inches) wide and 77 millimeters (3.0 inches) tall, representing a rather large area and has no physical mouse buttons. 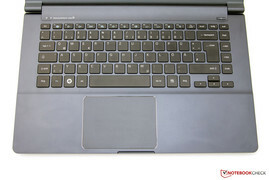 As with Apple notebooks, the bottom half of the touchpad serves as the left mouse button and can be easily pressed. Pressing this “mouse button” results in noticeable, pleasant feedback. 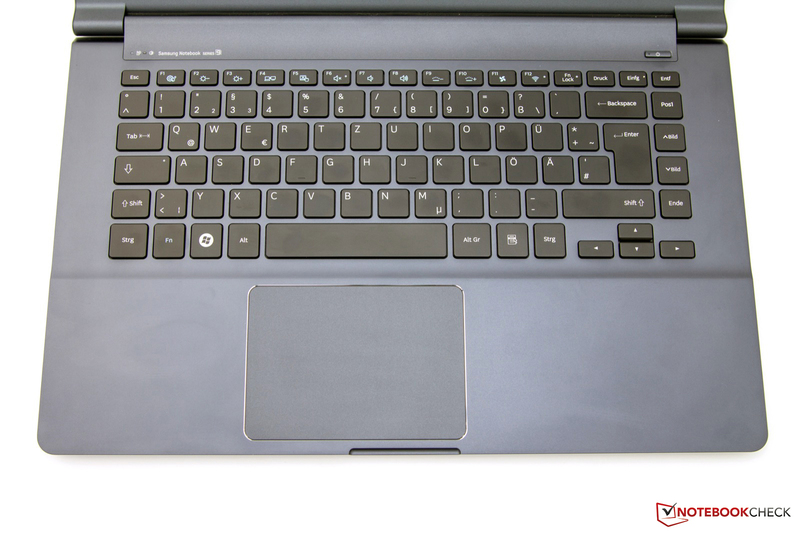 The right mouse button can be activated in the lower right area of the touchpad as is usually the case. 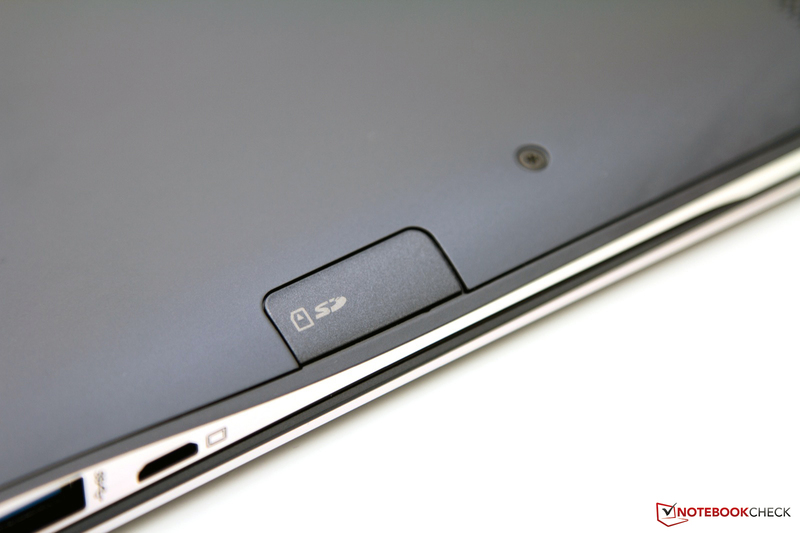 Due to these integrated mouse buttons, nearly the entire touchpad area can be used for navigation. The touchpad itself can be customized using the pre-installed ETDWare configuration software. As shown in the included example videos, the touchpad supports two-finger, three-finger, and four-finger gestures and is reminiscent of Hewlett-Packard multi-touch technology. 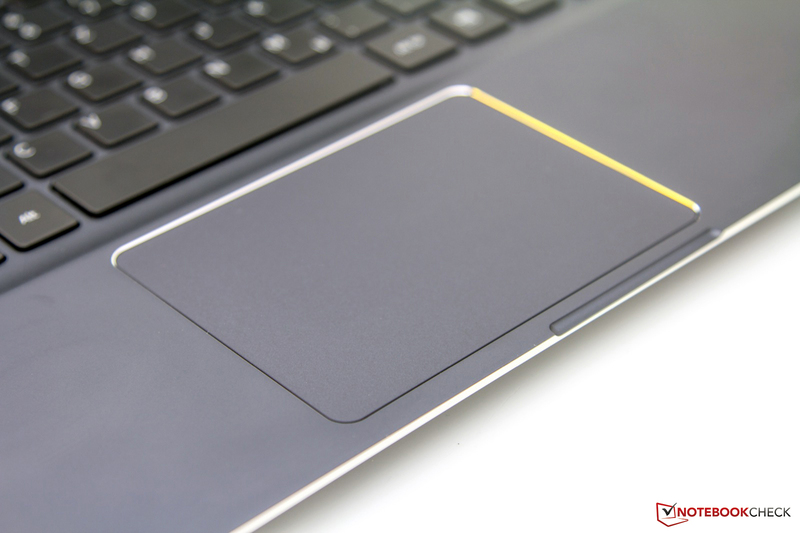 Last but not least, mention should be given to the aesthetics surrounding the touchpad. 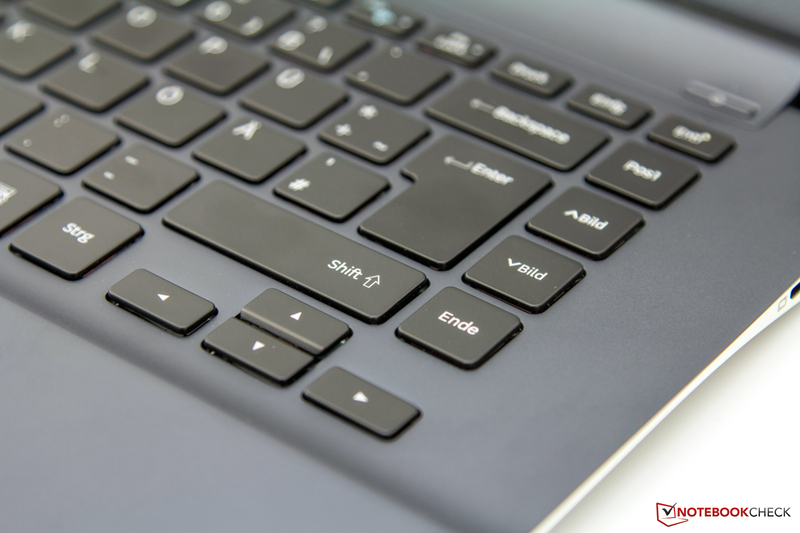 The rounded corners and thin, silvery rim allow the touchpad to merge seamlessly into the overall design of the notebook and add a rather stylish touch. Generous touchpad. The keys are integrated. For the 900X4B, Samsung chose a matte 15 inch Seiko Epson SEC0500 display featuring SuperBright technology. This display has a native resolution of 1600x900 in a 16:9 ratio (HD+). The choice of display reflects the Series 9’s principle of creating devices with high-end, high-brightness displays. While interpolated resolution levels cannot be selected in Windows 7, the notebook can drive external monitors, projectors, and TVs via micro-HDMI and VGA. As mentioned in the Connectivity section, external video adapters are not included and must be purchased separately. To determine the quality of the display, we conducted a series of tests. The first of these tests involved measuring the screen’s LED luminosity. The Gossen Mavo Monitor tool was used to measure brightness. Our test sample was observed to have a maximum luminance of 408 cd/m2 and an average luminance of approximately 362 cd/m2. At first glance, these results were promising. However, we also measured a vertical brightness decrease toward the lower edge. We observed a luminance different from maximum to edge of 74 cd/m2. Fortunately, this difference was not subjectively noticeable and the 82% brightness distribution surprised us as our subjective impression was a higher distribution. The other measured data was disappointing. Saturated black could not be displayed because of a high black value of 3.31 cd/m2 and the resulting contrast was a fairly low 111:1. By comparison, the 900X3A impressed with 0.64 cd/m2 and a high contrast ratio (630:1). When Samsung’s Service QL Lab tested the 900X4B, they observed a similar maximum brightness measurement of 411 cd/m2 but a significantly lower black value of 1.4 cd/m2. Using these measurements, the screen achieved a much better contrast of 294:1. As our sample demonstrated a subjectively dull picture and a considerably poorer black value than the MacBook Pro 15, featuring a matte screen, set up beside it for comparison, we can safely assume that our measurements were not erroneous. We will likely be able to assess another sample next week to clarify this issue. 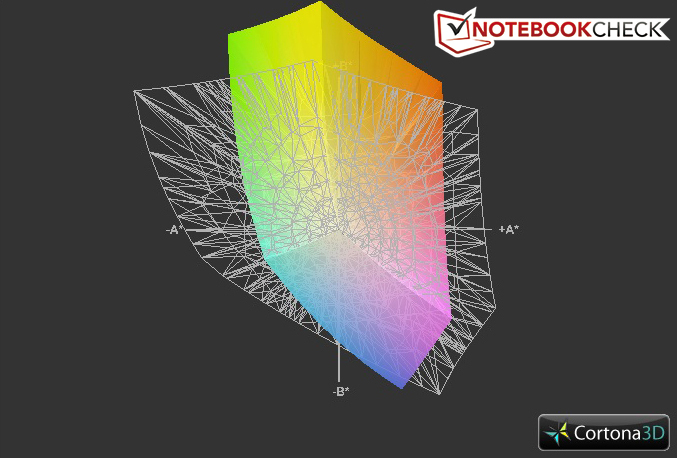 The reproducible color gamut is an important criterion for professional users. In another test, we determined that the 900X4B is not suitable for photographers due to the lack of the reference color spectrums (AdobeRGB and sRGB) despite the fact that the tested display was slightly better than its predecessor, the 900X3B. Most potential buyers can likely ignore this point. In a third test, we found the 900X4B questionable for outdoor use. While the matte display surface and fairly high brightness make outdoor use a possibility, the unit’s low contrast proved to be a limitation. Were the contrast higher, the notebook would be an outstanding outdoor option. 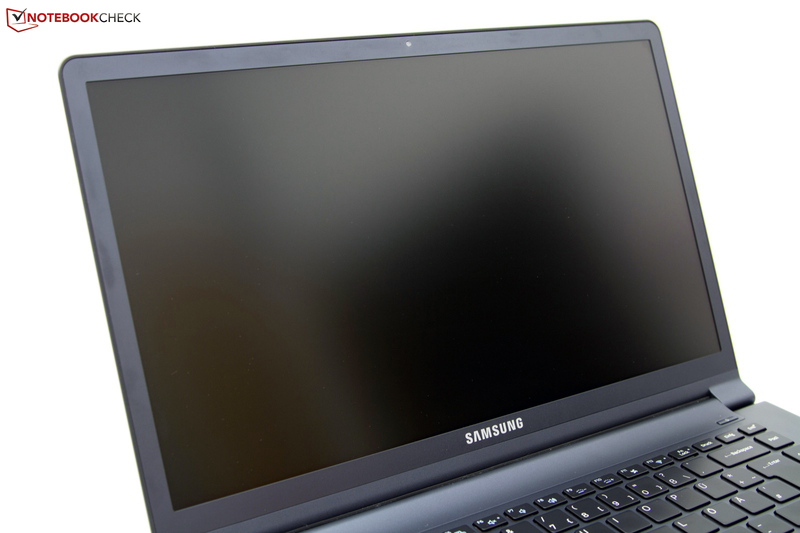 As it stands, however, the display becomes difficult to use in direct sunlight but still retains an advantage over other notebooks that use glare-type displays. Viewing angle stability was observed to be on par TN screens. The image remained stable even at narrow horizontal angles and deviations are hardly noticeable. By contrast, vertical angles were unstable. The slightest deviation from head-on caused the reference picture to fade or invert. 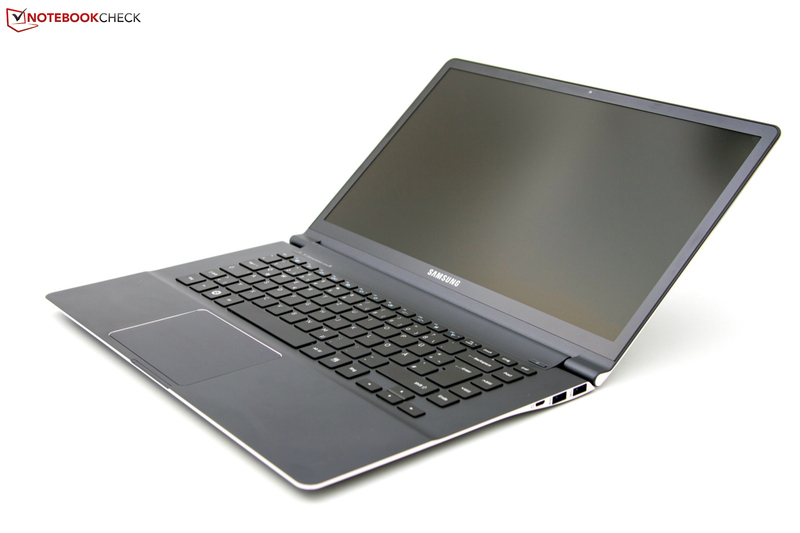 As mentioned in the introduction, Samsung is currently developing a future revision to the Series 9 family of notebooks using the third-generation Ivy Bridge Core i5/i7 family of processors. While Samsung has provided no firm timeline or samples for us to review, we intend to review these as soon as they become available. On the other hand, the 900X4B-A01DE features familiar hardware. 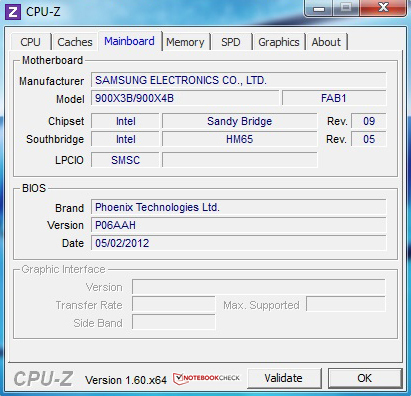 Samsung chose the Intel Core i7-2637M dual-core processor, a 1.7 GHz second-generation Core i7 Sandy Bridge processor. 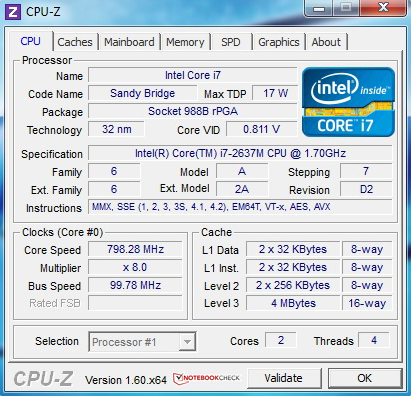 This dual-core processor features a maximum clock speed of 2.8 GHz thanks to Intel’s Turbo Boost 2.0 technology. This processor was also implemented, and reviewed by us, in the Dell XPS 13 ultrabook and the Acer Aspire Timeline Ultra M3-581TG. Other hardware includes the processor-integrated Intel GMA HD 3000 graphics card, 8 GB of DDR3 RAM, and a 256 GB Samsung mSATA SSD. This combination of hardware makes the notebook unsuitable for more than just basic gaming and, instead, is intended for multimedia applications and portability. Users seeking a notebook more focused on gaming will want to wait for Samsung to update the Series 9 to use an Ivy Bridge processor and the associated Intel GMA HD 4000 graphics card or look for a notebook featuring a dedicated graphics card. The recently reviewed Asus Zenbook UX32VD, featuring the Intel Core i5-3317U dual-core processor and a dedicated Nvidia GeForce GT 620M, is an example of a comparably sized device with a combination better suited for gaming. As the Core i7-2637M dual-core CPU has been tested before in the aforementioned devices and is no longer the newest of its kind, our commentary on the processor will be brief. The test system managed a score of 2.19 points in the latest Cinebench R11.5 64-bit multiple-core test and ranks in the middle of our CPU database. 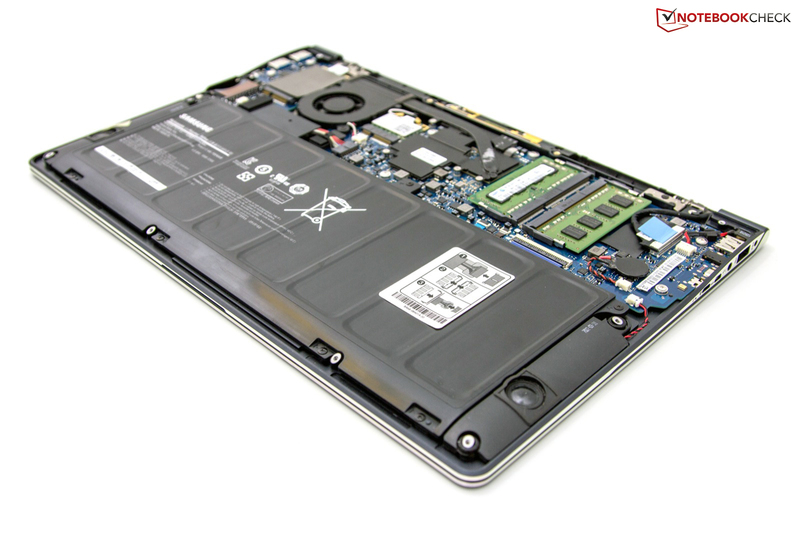 When compared to notebooks of similar size classes, the 900X4B falls behind the Ivy Bridge-equipped Asus Zenbook UX32VD which leads the 900X4B by about 10 percent with a result of 2.4 points. 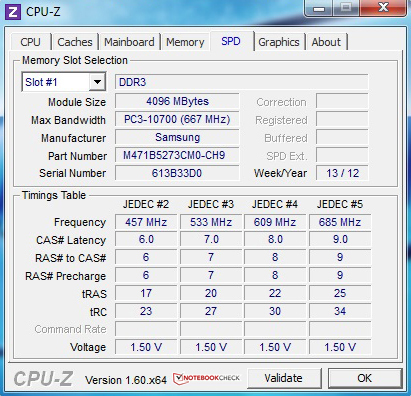 Based on this, we are curious to see how an Ivy Bridge-equipped Series 9 will perform. We tested the sample 900X4B in Futuremark's system benchmarks to provide a good overall view of system performance. The 900X4B does well with a score of 3,775 points in PCMark 7. By comparison, the Dell XPS 13 ultrabook using the same processor scored only slightly better. Compared to the predecessor, not much has changed as the difference between the 900X4B and the 900X3A is only 4% with the 900X3A scoring 3,609 points. Overall, the test system is located in the upper third of the database and is suitable for surfing the Internet and image editing, amongst other things. 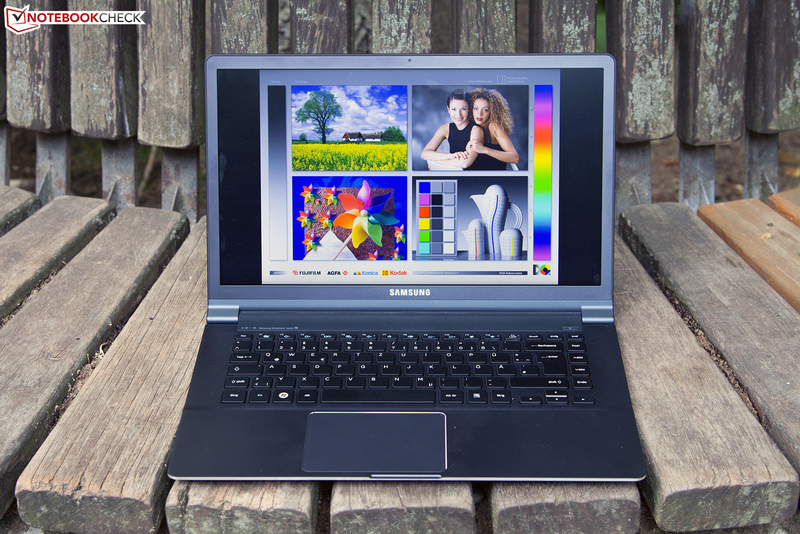 The system reaches its limits in sophisticated video editing and 3D rendering. By comparison, the UX32VD falls behind by over 50% with a score of 1,934 points due largely to its conventional hard disk. As its storage solution, the 900X4B uses the Samsung MZMPC256HBGJ Series 830 mSATA solid state drive (SSD) via a fast SATA III interface with a bandwidth of 6 Gbit/s as opposed to the SATA II interface used by most SSDs. The measured benchmark rates are accordingly good. 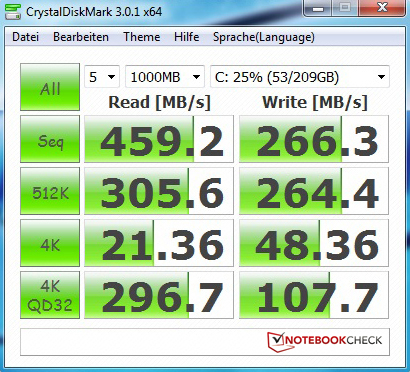 CrystalDiskMark observed a maximum read rate of 459.2 MB/s and a maximum write rate of 266.3 MB/s. Out of over 300 different drives in our database, this performance was good enough to place 17th. 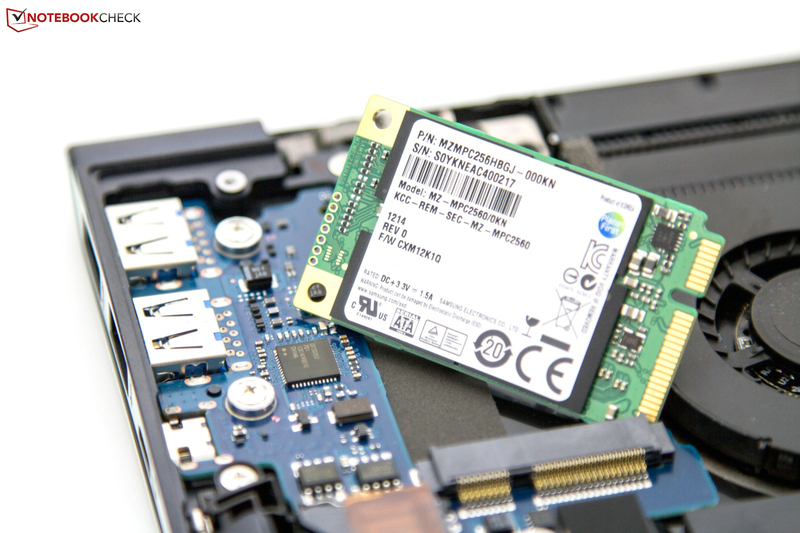 The SSD, as is the case for virtually all SSDs, has very low random access times. 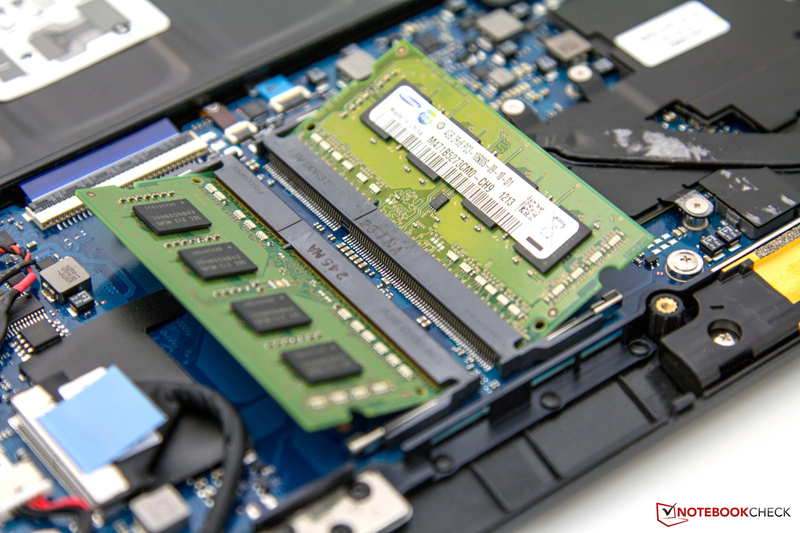 By the design, the SSD can easily be replaced but the performance and capacity of the included SSD makes it pointless to do so. The Intel GMA HD 3000 graphics card is designed for lightweight multimedia applications and is only capable of running the most basic of games or those that do not rely on 3D rendering. Futuremark's synthetic gaming benchmarks and experiences from previous tests confirm this. Our 900X4B test sample achieved 3,770 points in the popular 3DMark06. Similar configurations with processor integrated graphics also scored in the immediate vicinity. 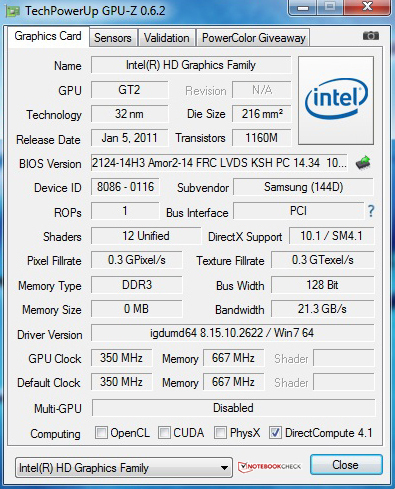 The newer GMA HD 4000 in the Asus UX32VD managed 4,840 points, representing a 28% performance gain. An important aspect of our reviews for many readers, a summary of the 900X4B’s gaming capabilities must be considered. We opted to test three popular games – DiRT Showdown, Mafia II and Diablo 3. Our results confirm weak 3D performance. These games were only playable under minimum settings and we did not find the games to be very fun as a result. Simpler games such as Fifa 12 or World of Warcraft (WoW) can be displayed smoothly to an extent, even at higher settings. The results of our Diablo 3 test were surprising as they were higher than observed using the newer, more powerful Intel GMA HD 4000. The likely reason for this improvement is an apparent update from Blizzard. All things considered, the 900X4B is not suitable even for casual gamers. 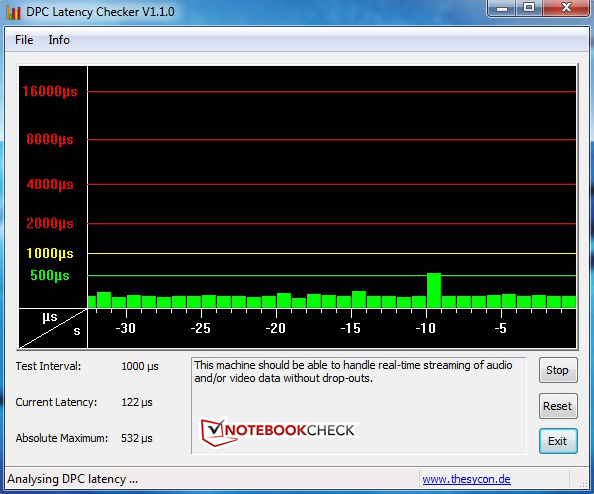 In order to determine whether the system undergoes throttling, we performed a system stress test. Our stress test consisted of simultaneous operation of both Prime95 and FurMark to fully load both the processor and GPU. We allowed the stress test to run for one hour and measured the component temperatures. Our results indicate that the system never reached the Turbo Boosted maximum clock rate of 2.8 GHz under load even when operating under AC power. 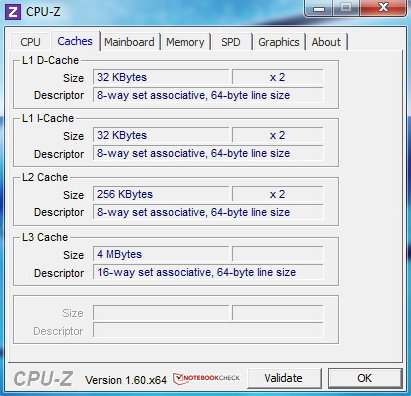 While HWiNFO recorded a clock multiplier of 28x, the CPU never exceeded the base operating clock of 1.7 GHz which corresponds to a 17x clock multiplier. Clearly Turbo Boost was not activated in this case. Once the stress test had concluded, the variable clock multiplier resumed normal operation and the processor was able to reach its full processor clock rate under Turbo Boost. By contrast, Turbo Boost was unavailable when operating on battery power and the system was strictly limited to the processor’s base clock. We ran Cinebench R11.5 again while running on battery power and achieved scores of 9.28 points in OpenGL rendering, 1.66 in the multiple-core test, and 0.68 in the single-core test. By comparison, the 900X4B achieved a score of 1.09 in the single-core test when running on AC power. These reduced scores correspond to considerable differences of -24.2% in the multiple-core test and -37.6% in the single-core test. Graphical performance was only marginally weaker by comparison. As mentioned in the introduction, the 900X4B features a small, compact package. Such packages typically create thermal quandaries as it becomes difficult to properly sink and dissipate heat when space is limited. The 900X4B, however, only requires a small cooling system. 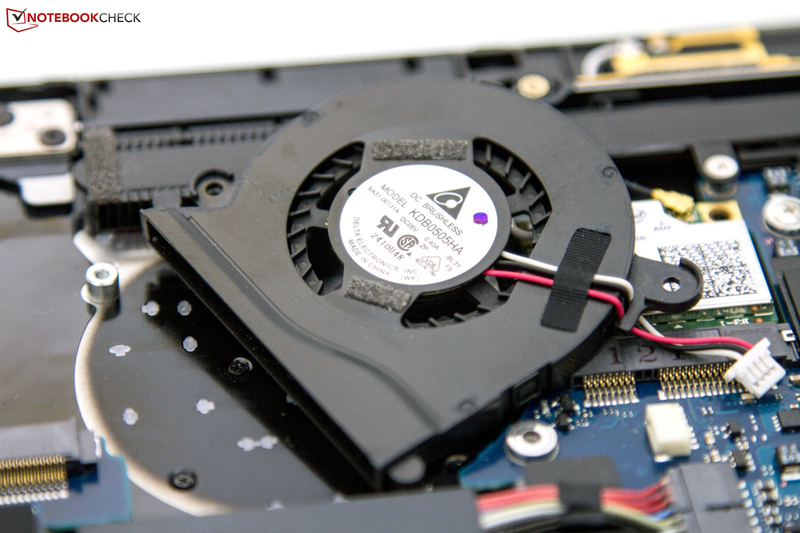 This modest cooling system combined with the lack of both an optical drive and a conventional hard disk yield a rather quiet machine with the fan being the only source of noise. 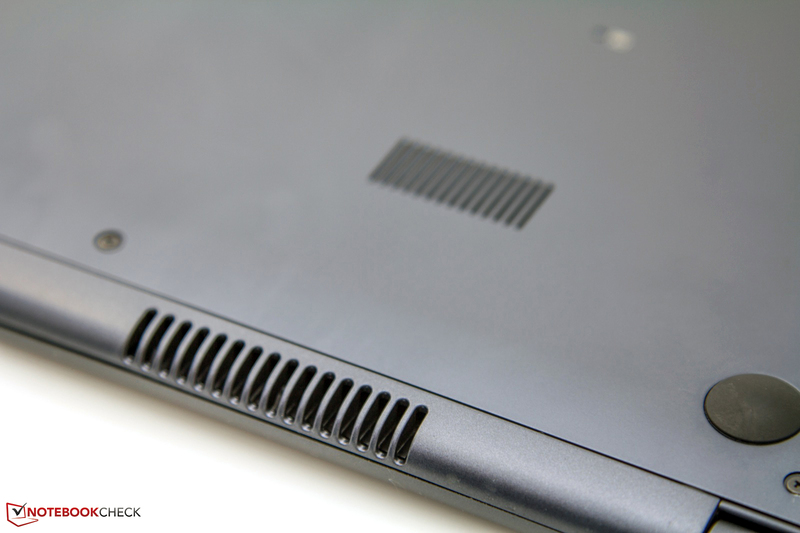 To further reduce noise, the fan is virtually inactive during idle. We observed that the fan would activate occasionally and only for short durations to supply the internal components with cooler air. Under load, fan noise was significantly more noticeable and peaked at a very audible, high-pitched 42.2 dB(A). The 900X3A was much quieter with an observed maximum of 36.8 dB(A) under load. It should be noted, however, that the fan in our test device quickly reduced speed after relatively short periods of active cooling. The entire cooling system in the 900X4B’s slim case consists of little more than a heat pipe and a case fan. This combination results in noticeable temperatures during operations, a factor compounded upon by the rather tiny vents that serve as the heat exchanger. While the system is idle, the fan is rarely enabled and the sole means of heat dissipation is via heat dump through the aluminum surfaces. While hardly ideal, the case surprisingly remains a pleasant average temperature of 30.7 oC (87.3 oF). By our subjective assessment, the case remains cool to lukewarm to the touch. This obviously changes once the system is placed under load. The exterior becomes considerably warmer to the touch, peaking at a maximum temperature of 48.0 oC (118.4 oF) in the rear near the exhaust vents. The wrist rest, serving as an ergonomic area and likely point of human contact, largely remains unaffected by the increased thermal dissipation and stays in the range of 31.0 oC to 35.0 oC (87.8 oF to 95.0 oF). Unfortunately, this does not apply to the keyboard whose keys’ surfaces increase in temperature under load as a consequence of the solid unibody construction. A more efficient cooling system with two smaller, quieter fans would have been a better solution. (-) The maximum temperature on the upper side is 48 °C / 118 F, compared to the average of 33.9 °C / 93 F, ranging from 21.2 to 62.5 °C for the class Office. The 900X4B features two built-in stereo speakers with a rated output of 1.5 Watts each. After listening to a few music tracks, it quickly became evident that these speakers are only suitable for audio books and podcasts. While the high ranges were rendered clearly with sufficient volume, the speakers lacked both the mid-range pitches and deep bass required for the enjoyment of music and movies. The HDMI port and audio jack were sufficient in our function tests using high-end peripherals. USB headsets were also used without problem. For mobile devices, power consumption is always an important factor and often is the single most important factor. In our power consumption test, we found that the two primary power consumers in the 900X4B were the integrated processor and graphics package, and the 15 inch display. We observed power consumption between 6.9 and 12.9 Watts during idle. While acceptable, the Acer Aspire Timeline Ultra M3 demonstrated greater energy efficiency with a 7.9 Watt maximum power consumption rate during idle despite having the same processor. On the other hand, the 900X3A consumed between 8.3 and 16.6 Watts while idle despite having a smaller display. Under the stress test’s simulated load, the 900X4B consumed more power and reached a peak consumption of 42.4 Watts. 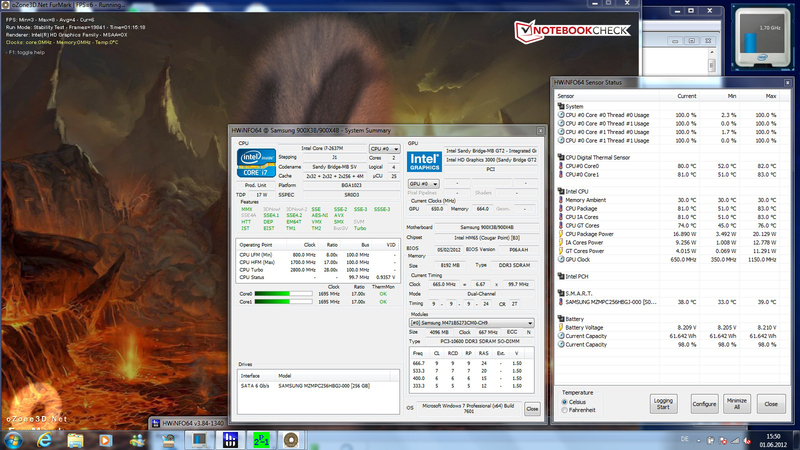 The Aspire consumed more power at 55 Watts under load due to its dedicated GT 640M graphics card. On the other hand, the 900X3A consumed only 33.7 Watts due to its smaller 13.3 inch display and weaker processor. 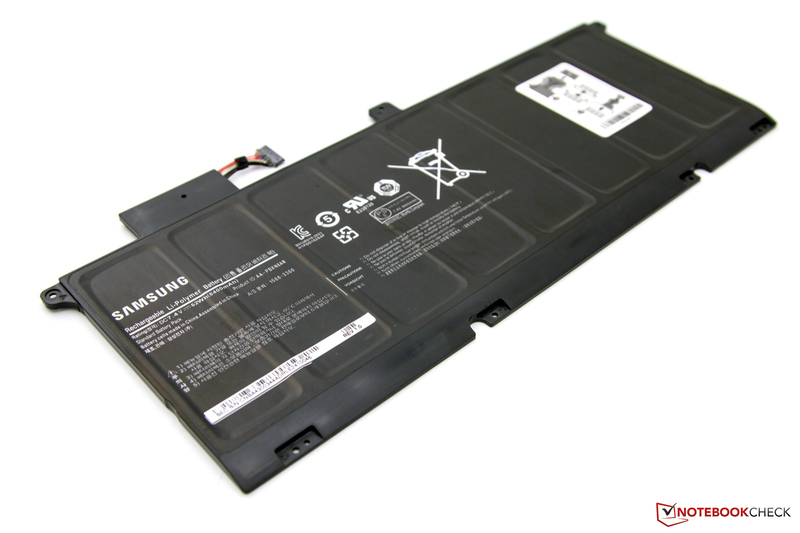 To provide portable power, Samsung chose an 8-cell lithium-polymer battery with a designed capacity of 62 Wh, 15% larger than the 54 Wh battery found in the Acer Aspire. The included brick-and-plug style power adapter has sufficient power to recharge the battery but hardly earns any style points. The 900X3A featured a sleek travel charger similar to those used for smart phones and we would have liked to see a similar power adapter for the 900X4B. To test battery runtime, we performed our typical Battery Eater tests. We used the Classic Test to load the system by setting the display to maximum brightness, enabling all wireless technologies, and selecting Windows 7’s high-performance profile. We measured a minimum battery runtime of just less than two hours. Using the Reader Test, we measured the theoretical maximum battery runtime by simulating the reading of a text document using minimum display brightness, selecting the highest energy-saving profile, and disabling all wireless connections. We observed an impressive runtime of 11 hours, 57 minutes exceeding the 11 hour, 39 minute runtime of the Acer Aspire Timeline Ultra M3. This result matches our commentary in the previous section regarding the Aspire’s lower idle consumption but correspondingly smaller battery. For a more balanced and realistic test, the "Surfing Via Wi-Fi" assessment was performed with a screen brightness of approximately 150 cd/m2 and wireless enabled. We measured a good runtime of 7 hours and 13 minutes. This runtime should prove sufficient for most trips and will allow productivity without restricting mobility. The built-in battery could end up becoming a make-or-break criterion for many customers as no docking port is available for an additional battery. The Samsung 900X4B-A01DE is the latest member of the premium Series 9 family of ultrabooks and seeks to not only continue the previous generation’s excellence but also reach out to a larger customer base seeking lightweight mobile devices with a 15 inch display. The 900X4B features a revised aluminum unibody chassis that leaves an excellent impression on all points. The included hardware is both familiar and pleasing. While we are disappointed the 900X4B does not feature the third-generation Ivy Bridge family of processors, we look forward to the next revision of the Series 9 family which will include Ivy Bridge dual-core processors. That said, the 900X4B is still an excellent device featuring the Intel Core i7-2637M second-generation Sandy Bridge dual-core processor. The easy maintenance of the components and thorough interface diversity received high regard but the lack of at least one external display adapter – either micro-HDMI to HDMI or VGA out – somewhat curtailed our enthusiasm. The input devices have also been slightly revised and prolific typists will appreciate the keyboard’s good feedback and large wrist rest. We also observed very good battery life and relatively low power consumption with low idle emissions receiving bonus points. The temperatures and noise associated with the notebook under load were noticeably higher but remained acceptable. While significant time has been spent discussing the hardware merits of the 900X4B, it cannot be understated that the driving purpose of the Series 9 was and remains the Samsung philosophy of providing a high-quality display. The 900X4B features a 15 inch matte display with a native HD+ 1600x900 resolution and these traits gave us hope. In our tests, we found that the brightness of the display was very good but this was partially offset by a somewhat uneven brightness distribution and a disappointingly high black value. This forces us to pose the question: Why did Samsung not choose a high-quality in-house LED LCD display for this device? In summary, we found the 900X4B-A01DE to be a very stylish premium device that is available for around 1750 Euros ($2200 USD). While it has many strengths and positive features, we feel that its mediocre screen does not fit either the Series 9 designation or the general expectations of devices of this class. Therefore, we cannot give the notebook a “Very Good” rating. 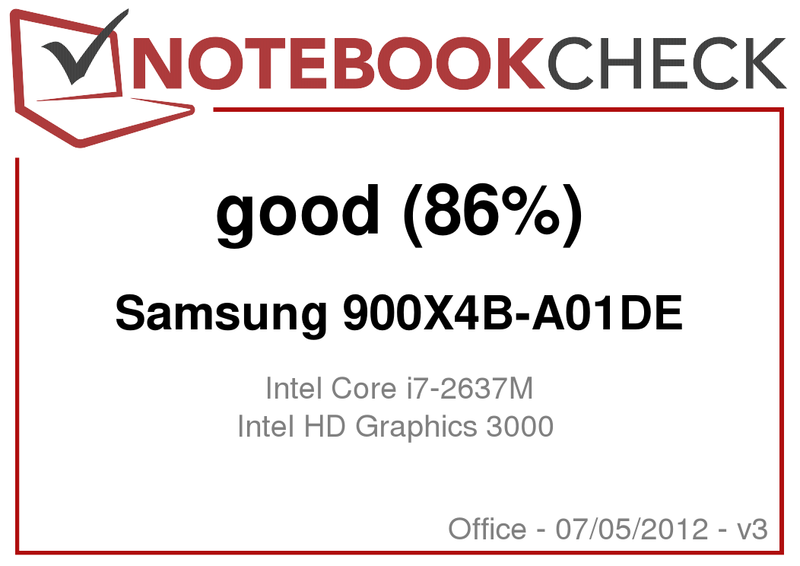 Instead, this Samsung notebook will have to settle for a merely “Good” rating. We tested the new 15 inch notebook from the Series 9: 900X4B. The keyboard features a subtle backlight. Level 1 (up) is very weak. Level 4 is not particularly bright either. Intuitive setting of the touchpad (ETD-Ware). Looks like Apple. An ambient light sensor adjusts the screen brightness if wanted. The vents on the bottom are designed quite small. Up-side-down: The minimalistic impression is continued. The innards are freely accessible after opening the chassis. 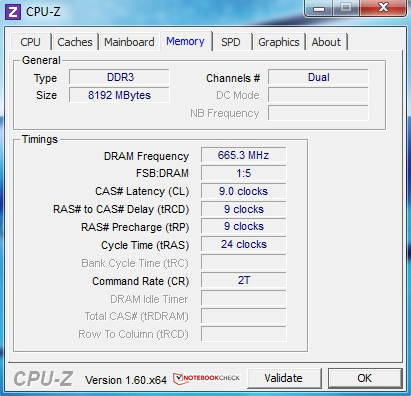 8 GB of DDR3 RAM on two banks are built in ex-factory. 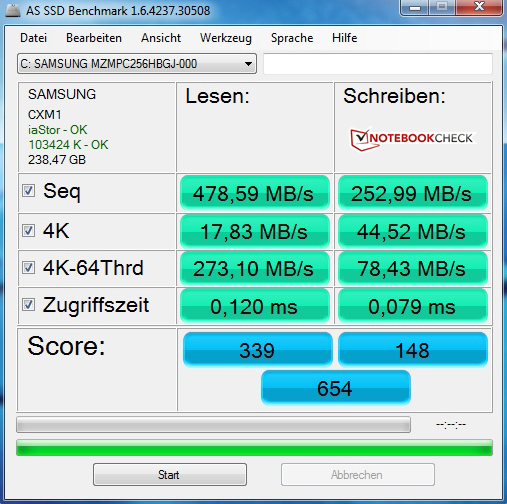 Small and swift: Samsung's mSATA SSD with a capacity of 256 GBs. A small case fan including heatpipe are to cool the system. 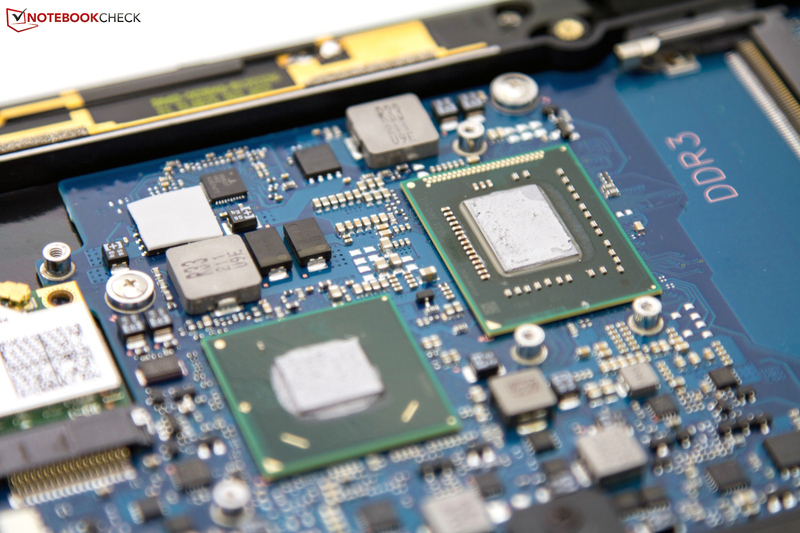 An Intel Core i7-2637M dual core CPU is beneath it. The 8 cell battery (li-po) takes care of battery life. Weight: 355 grams. The additional key row interferes with ergonomics at first. The thin and matte display bezel is particularly good-looking. and the restrained design have been maintained. The case's rounded sides are a distinctive feature. A small recess helps open the lid. Slim and light 2.0: 14.9 mm build height and 1.68 kilograms. Fortunately no stickers mar the first impression. The connectivity does not need much room. USB 3.0 is installed. Regrettably, only an RJ45 adapter is included. No, we did not put the memory card underneath the device. Samsung hides the built-in card reader elegantly. The display hinges give good grip. Including teetering. Drained? The included power adapter ensures recharging. The case's new design, the aluminum unibody's workmanship and the altogether good overall impression. Above all, a higher quality screen whose measured data convinces across the board. The screen's matte surface and the resolution are a good start. Also, we miss the HDMI and VGA adapter in scope of delivery. That the cooling system has not been modified much. We would have appreciated a more quiet and efficient solution. Perhaps the Ivy Bridge update will supply new findings. Until now, only few 15 inch notebooks with a slim aluminum case are available. 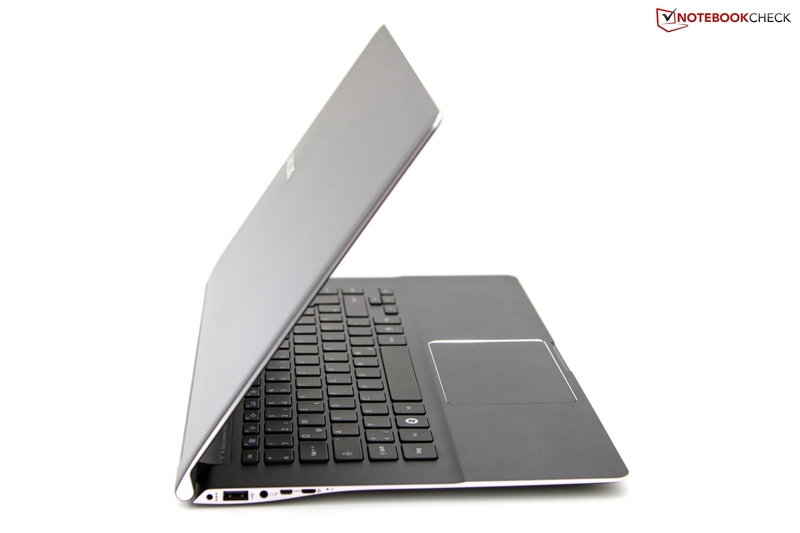 One candidate is Acer's Aspire Timeline Ultra M3-581TG ultrabook. On the other hand, there are currently many 13.3 inch ultrabooks on the market. 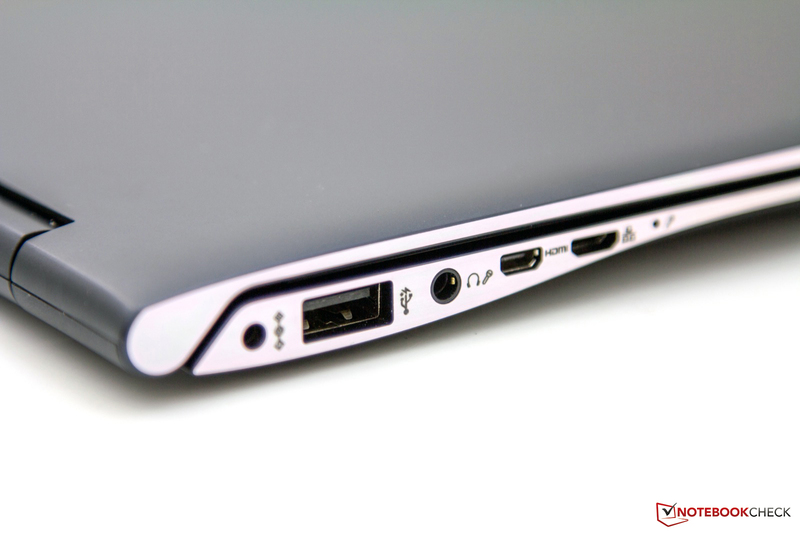 Asus' Zenbook UX32VD supplies a first outlook at the upcoming devices featuring Intel's Ivy Bridge processor. Then again, Apple will possibly be introducing a new 15 inch MacBook Air or slimmer MacBook Pro models in a few days. Stay tuned!